Please add vector shapes with variable feathering to the local correction tools in Lightroom. Filling in shapes with the adjustment brush all the time is just not much fun and makes it harder than necessary to make changes afterwards. I thought about a means to make it adjustable after the fact without braking the current paradigm and even leaving it backward compatible with Lightroom versions down to 2.0 (or Photoshop CS4 with ACR 5.0). Why not make the actual path of the brush stroke visible and adjustable after the fact, as well as the radius, feather and flow or the stroke? I'm an amateur photographer which just play and tweak my personal DSLR photos within LR 3 (legally owned, BTW). So, as LR4 beta phase is open, I would like to ask for a MUCH DESIRED FEATURE. This feature is just a Polygon-like Adjustment Tool. The current Adjustment Brush is a "spray painting" tool which is really cumbersome for using on a very well defined area of your photo. An example: you want to tweak just the wall of a building (let's say brighten it), but you don't want it to spread the settings across its edges over the surrounding background or sky. As you have to "mouse paint" with the Adjustment Brush, you usually end applying corrections outside the strictly desired area or wasting a lot of time with tiny brush sizes. (And "Auto-mask" doesn't normally help either but in very few simple situations). A much more friendly tool in these situations would be just drawing a polygon which sets the boundary for the adjustment settings (with the outside "feather" transition area also available). I suppose this tool, or similar, exists in Photoshop as "Mask" or whichever other description, but I would gladly pay for it in LR 4.0. Lightroom: Polygon-like ("Mask-like") Adjustment Tool. I would love Lightroom to have bezel masking. I do a lot of Jewellery retouch and I use the brush to edit the shots but would love it to have a path masking to speed up the edits. Lightroom to have bezel masking. My thoughts on this are that I would like the current adjustment brush automask fixed first as it needs some TLC. After that, I would like the entire localized editing approach re-engineered to allow masking of any edit in the dev module. Lightroom is missing the ability to select a specific square or polygonal area like a window or doorway - then make adjustments to that selection. Read on. You will see why this is so important. As an architectural and Real Estate photographer, I photograph interiors that have bright windows or interiors leading to another interior that have a completely different color temp. The white balance, color, and brightness are almost always different and need to be selectively adjusted. But the selection areas are square, not round. The brush tool is a circle and doorways and windows are square or polygonal. The gradient tool falls short because it can't be constrained to a doorway or window. Currently, I have to launch Photoshop, make selections, and the make adjustments within the selection. But Photoshop has no white balance dropper, so I find myself either guessing, or doing full-on color correction, not good time management for run-and-gun economy jobs such as Real Estate photography. Adobe, this could be a wonderful, much needed addition to Lightroom. If you need specifics, I will be happy to reply with details. If you are a photographer, and find that a square, polygonal, and magnetic selection adjustment tool would be useful to your workflow, please add a comment. Adobe will add this to Lightroom if they understand the importance and usage. Thanks in advance. Lightroom: Please add a polygonal selection adjustment tool. Well, it's all been said already ... I ended up here, looking for how to do a polygonal selection. Very much desired. I realize this is an older suggestion, but I overwhelmingly support this proposed feature. I think additional, transformable shapes should be added to the Radial Gradient feature. I envision it implemented as polygonal sided shapes, i.e., 0 = circular/oval; 1 = Line (already implemented as the Graduated Filter tool); 2 = graduated "V" shape; 3 = Triangle; 4 = Rectangle; etc. all the way to a 10-sided (or more) polygon. The polygons can be either equilateral or non-equilateral, and either sides or vertices can optionally have convex or concave curvature added as desired. Spin, rotation, skew, symmetry, distort, (etc.) transformations should be available to the selected shapes. This reply was created from a merged topic originally titled Camera Raw/Lightroom: 'Polygonal Area' Adjustment Tool. This reply was created from a merged topic originally titled Lightroom: Polygon tool for creating masks a bit like the radial tool. 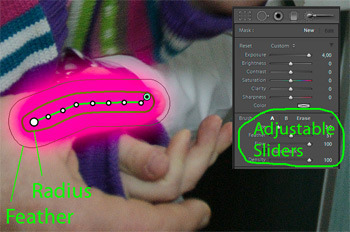 It would be really handy to have something like this in Photoshop to manually adjust a selection's feather. https://youtu.be/K8Fd7Kwch2g?t=1m58s If that tool exists, just let me know I'm being silly. Also, having a live view of what your feather looks like outside the selection when you apply the feather would be incredibly useful for those that can't visualize what "X" pixels feather radius looks like on their "Y" pixel document. This reply was created from a merged topic originally titled Photoshop: Variable feather mask. I wonder whether it would be possible to implement a variable feather mask option. I'm looking for the solution found in some color grading and rotoscoping softwares, where the user can create a bezier based path, then offset it either insde or outside or both sides thus creating a region of feather. This reply was created from a merged topic originally titled Photoshop: Vector mask feathering per point. I'd like to see Photoshop start integrating some of the tools I often find in other VFX software that I find really useful. Namely improving vector masks so that feathering can be controlled on a per point basis. It would be great if the user could paint a kind of "Feather map" that allows for specific feathering and easing between points. In conjunction with this, it would be great if the user could define relationships between different vector shapes, and set up parent child relationships between points so that when one mask is altered, the other is altered with it. MOCHA has a similar parent child point feathering system right now with their rotoscope tools, and Modo's vertex map weight system would serve as the perfect model for "feather mapping". This reply was created from a merged topic originally titled Photoshop: feather adjustments to individual vector points in a shape layer. I like Photoshop's Feather and Density adjustments to vector shapes in the Properties panel. The adjustment effects the entire shape layer. I would love if this could be pushed further to be able to make these adjustments to individual vector points that make up the vector shape (not unlike Illustrator's gradient mesh tool's ability to define individual points of color). For example if a point had 20 pixel blur and the next point had a 10 pixel blur there would be a gradual feather along the shape edge between the two points. I can't imagine someone is not already working on this.